Are you losing out because you are not using gift cards, loyalty cards or promotional vouchers? A successful business is always improving and responsive to changing customer needs. Here are some tips on making small changes that can increase your sales and boost your customer service. A Gift card is a preloaded card that allows the cardholder to purchase goods or services to the value of the card. It is a great way to acquire new customers while retaining the loyal ones. Gift cards are an extremely effective marketing tool that can be prominently displayed at the cash register or front desk for easy access. Although gift cards are often set to a specific amount, many customers will end up spending more. The gift card encourages customers to enter your store and browse products. Once they’ve started shopping, it is likely that they will find products that cost more. Highly popular, they rank as the second-most given gift by consumers and the most-wanted gift by women. 61% of gift card holders spend up to 60% more than the amount gifted. 90% of gift cards are used within 60 days, increasing revenue. Designed to match your company logo and brand, a gift card is an effective marketing tool. As people purchase more gift cards for family and friends, your brand will reach new customers. Using gift cards for customer credits and merchandise returns will limit exposure to fraudulent transactions while encouraging repeat business. A Promotional Voucher is a code or document that can be exchanged for a discount when purchasing products. Promotional Vouchers are widely used to draw first-time customers or to increase purchase amounts for current customers. These vouchers are generally used in retail stores as a part of a sales promotion. Vouchers can be sent directly from within SI+ to targeted customers/prospects by SMS or email. 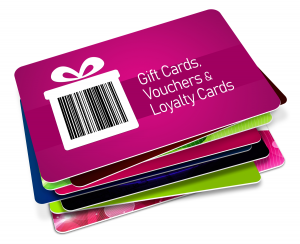 A loyalty card program is an incentive plan that has two advantages. Firstly, it allows a retail business to gather data about its customers such as contact information and spending habits. Secondly, it is used to build repeat business by rewarding repeat customers. The accumulation of loyalty points toward a reward makes customers more likely to return. It also provides you with information about the customers that assist in meeting their needs more effectively. In addition, loyalty program operators often report that once a customer starts redeeming rewards, their enthusiasm to return rises considerably. This leads to much higher levels of customer retention. You can use this data to segment your customers for improved marketing, sales and customer services. Best Customer Marketing involves spending more time, effort, and money on the best customers in order to maximize your return on investment. Not surprisingly, the principles of best customer marketing are the driving force behind the leading loyalty programs in the world today. Significant savings can be made by targeted marketing campaigns. There is no need to send out thousands of flyers that will be thrown away unread or take up newspaper space that is irrelevant to many readers. The added benefit of targeted advertising is the fact that it can be measured to gauge its effectiveness.